I love perfume houses with a great story. And the story behind Floris is precisely why I chose one of its fragrances for “Forget Me Not” this month. It has not been an exceptionally long time since Seringa was released (1992), however since it is the only sample I have other than the more recently released China Rose, it will suffice for April. Add to that fact the scent could make an addition to a springtime work fragrance wardrobe, and we are in business. I have been hoping to review a Floris of London fragrance for quite some time but I have been limited by the two previously mentioned samples I received in New York City last fall. How I wish there was a Floris counter in my hometown! I would thoroughly enjoy the quest to find “my scent” and fill my bathroom with its accompanying toiletries that are so plentifully available. So let us move on with the story, shall we? Floris of London was founded during the year 1730. It was a year of abundant arts, culture and tragedy. The Life and Death of Tom Thumb the Great by Henry Fielding was playing at Drury Lane Theater, the oldest English theater still in use; an actor and playwright named Colley Cibber was named poet laureate of Britian due to his works centering on political intrigue; and the Russian czar died of smallpox on his wedding day at the tender age of 14. Additionally an opportunistic man arrived in England to seek his fortune from his native Menorca (the second largest of the Balearic islands of Spain). His name was Juan Famenias Floris. He began a business by setting up shop in the elegant St. James quarter of London, where he worked as a comb-maker and barber. However, eventually he missed the aromas of his native land and began experimenting with oils, essences and fixatives. Thus, Floris of London was born! Floris is run to this day by eighth generation descendants of Mr. Floris and the house focuses on “superior products where craftsmanship and quality is paramount,” according to their website. Seringa, a fruity floral, theoretically centers around the “mock orange blossom” or seringa flower. In fact, I have not been able to find anything on the actual scent of the seringa flower but rather the seringa tree that yields rubber. Not to worry, however, since the remainder of identifiable notes give this scent its character: notes such as violet leaf, lily and oakmoss. This initially crisp, leafy green, not in the least bit sweet floral begins quite sharp – so much that I encourage you to avoid sniffing for at least a full three minutes. It is in my inability to identify one particular note (in the words of Luca Turin) that makes this scent’s composition exceptionally good. Seringa is shower-fresh that lasts all day. It is a quiet scent when applied lightly and it leaves a woman smelling nice but not perfume-y, subtle and humble, crisp and clean. Interestingly, several of the representatives at Floris claim that it was a favorite of Princess Diana. That fact perhaps inspires many purchases of the fragrance, but is it really full-bottle worthy? If you enjoy smelling faintly like floral soap, faintly like a spa, and faintly like greenery added to floral bouquets, this scent is for you. I would gladly purchase the body cream to wear on days that I need a quiet fragrance. But I will not be adding a full bottle to my collection anytime soon due to my boredom* with the fragrance. There is positively nothing about it that causes me to swoon, much like the uniform I wore in parochial school. It is just there. It serves its purpose and sometimes looks nice, but I would not choose to wear it to impress. The history of the house has me intrigued, though. I would like to find one from the collection that works for me. Any suggestions? Please be sure to visit Divina's review of Nina by Nina Ricci at Fragrance Bouquet. *When Divina and I came up with the concept “Forget Me Not”, we agreed that there may be scents that fall into this category that we do not like. It is not that I do not like this one, however. I am simply unmoved. 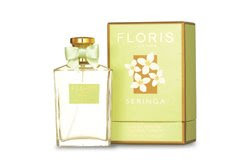 Floris Seringa is available at florislondon.com and various online perfume discounters. You might also find a good deal on it at Marshall's or TJ Maxx. Hi T. I have never seen this one, and I read an article once of a woman obsessed over one of the Floris scents.. but, I cannot remember which one.. sorry.. I will try and find the name of that one and send it on ..
Too bad this one was not a winner on you. Wow ! Enchantée to meet this blog,as you I'm crazy about perfumes and all related to them. I just bought Seringa few days ago and love it. Very interesting blog,and I happen to know that the 1st Floris was from Menorca! Best regards from a new follower from Ibiza.